Joe Hiller, who has a rare inherited disease, has become the first person in the world to participate in a new trial which could alter the lives of fellow sufferers. Joe who is four years old and from Shropshire has the condition, Hunter Syndrome, which affects around 80 people in the UK. The Royal Manchester Children’s Hospital is the only hospital in the UK to be delivering the study. Hunter Syndrome (also called mucopolysaccharidosis Type II or MPS II) is a progressive and life-threatening disease that primarily affects males. The syndrome is usually diagnosed in childhood, with sufferers having difficulties growing normally and with hearing, skin changes, frequent ear, nose and throat infections, joint problems, and breathing. In some cases there is also a delay in a child’s development, for which there is currently no effective treatment. Parents, James and Emma Hiller, were first prompted to seek medical advice, because they were concerned about the development of Joe’s speech and that he always seemed to have a runny nose. Joe was diagnosed with the condition when he was three years old. 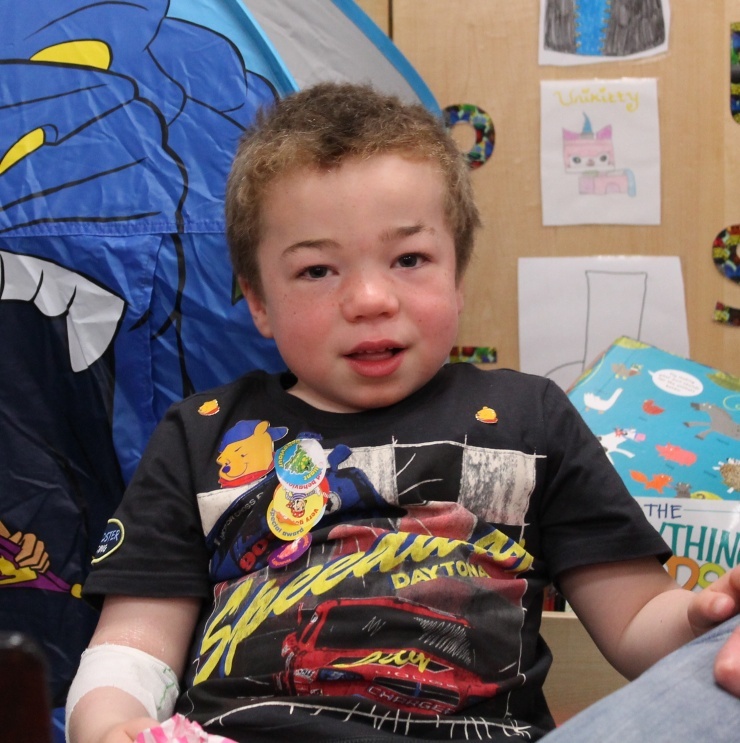 He is one of six patients the NIHR/Wellcome Trust Manchester Children’s Clinical Research Facility hopes to recruit to take part in the new trial. The study aims to test a new treatment that researchers hope will reduce the developmental delay and improve the learning ability of patients with Hunter Syndrome. Neither Joe’s parents nor the hospital can reveal whether Joe is on the treatment or control arm of the study, as this would skew the results. However, all involved hope that the study will demonstrate that the new treatment is effective and safe. Father, James Hiller, explains why taking part in research is a good opportunity: “Joe received the first few months of clinical treatment, enzyme replacement therapy, at Birmingham Children’s Hospital. Joe has more recently been able to have this therapy at home, and this seems to have helped with his general movement and stiffness. The study is being led by Dr Simon Jones, Consultant in Paediatric Inherited Metabolic Disease at Saint Mary’s Hospital, Manchester. Dr Jones, who is also Honorary Senior Lecturer at The University of Manchester, explains: “We are very keen to have a treatment that can change the learning ability of our patients, as this is clearly an area that needs a treatment and we are excited to be part of this trial”. Clinical Research Fellow and Speciality Trainee in Clinical Genetics, Dr Catherine Breen, adds: “The children that take part in our research studies have complex medical needs, so their care must be carefully coordinated by a specialist team. It’s our specialist knowledge and infrastructure that enables The Royal Manchester Children’s Hospital to deliver studies like this one. The study is sponsored by Shire and supported by the National Institute for Health Research Clinical Research Network. International Clinical Trials Day is on or around 20 May each year and commemorates the anniversary of the very first clinical trial by James Lind. CMFT is one of a number of Trusts celebrating International Clinical Trials Day in 2014, and under a single theme of ‘it’s okay to ask’, set by the National Institute for Health Research (NIHR). By focusing our efforts on one theme nationally, we hope to have a greater impact. The theme ‘it’s okay to ask’ is intended to empower members of the public to have the information and confidence they need to raise the subject of clinical research with their doctor if they wish to. The study will assess the safety and effectiveness of the intrathecal use of the medicine Idursulfase-IT (HGT-HIT-094), in paediatric patients diagnosed with Hunter Syndrome and with early developmental delay. The patients taking part in the study are already receiving Idursulfase (Elaprase®) intravenously (an injection into the vein). However, as the medicine is unable to reach the brain due to the blood:brain barrier, it is unlikely to reduce the cognitive impairment, associated with the condition. By administering the medicine intrathecally, directly to the child’s brain via the fluid around the spinal cord, clinicians will be able to assess the safety of the medicine and its effectiveness in reducing cognitive impairment. Patients taking part are randomised to the control arm or the treatment arm of the study. All patients will continue to receive Elaprase therapy intravenously throughout the study. The patients on the treatment arm of the study will receive intrathecal Idursulfase-IT for 12 months via a surgically implanted intrathecal drug delivery device. All patients will be invited back regularly to the National Institute for Health Research/Wellcome Trust Manchester Children’s Clinical Research Facility at The Royal Manchester Children’s Hospital, where the study is taking place. The NIHR/Wellcome Trust Manchester Clinical Research Facility (MCRF) is a purpose-built unit focused on supporting experimental medicine research helping to bring new drugs and medical devices into patient care. The facility is based at Central Manchester University Hospitals NHS Foundation Trust and receives funding from the National Institute for Health Research (NIHR). The MCRF offers state-of-the-art equipment and facilities for adult and children’s studies, and has a team of specialist research nurses and support staff. A satellite unit the Children’s CRF in the Royal Manchester Children’s Hospital is at the cutting edge of research into inherited renal, metabolic, and hearing disorders. April 2006, the NIHR has transformed research in the NHS. It has increased the volume of applied health research for the benefit of patients and the public, driven faster translation of basic science discoveries into tangible benefits for patients and the economy, and developed and supported the people who conduct and contribute to applied health research. The NIHR plays a key role in the Government’s strategy for economic growth, attracting investment by the life-sciences industries through its world-class infrastructure for health research. Together, the NIHR people, programmes, centres of excellence and systems represent the most integrated health research system in the world. For further information, visit the NIHR website (www.nihr.ac.uk). We provide researchers with the practical support they need to make clinical studies happen in the NHS, so that more research takes place across England, and more patients can take part.